Nestled in the scenic and lively Heavenly Village, Grand Residences by Marriott, Lake Tahoe offers travelers an appealing mix of convenience and luxury. Featuring everything from studios to spacious one- and two-bedroom units, our resort's fully-equipped residences are ideal vacation choices for families, couples, and groups alike. 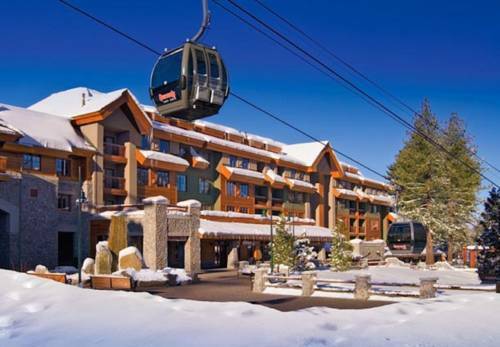 Skiers will love our proximity to Heavenly's gondola; we're also close to an array of year-round activities in South Lake Tahoe. What's more, our location in Heavenly Village means a plethora of fine dining, entertainment, and shopping are all within reach. While we want you to feel at home here in Lake Tahoe, our resort's amenities - including an on-site spa, full fitness center and heated outdoor pool - will also ensure that you feel like you're on a relaxing vacation. Plan your stay at Grand Residences by Marriott, Lake Tahoe, and see how fulfilling a vacation with us can be.